Cord cutting hasn't been a trend for all that long – less than a decade, really. But a lot has happened in this space in a very short time, so it's worth taking a moment to take stock of all the trends we've been following. So class is in session: this is Cordcutting.com's history of cord cutting. We're keeping things simple here so that you can read this all in one sitting. We're focusing our history of cord cutting on four major things: the market landscape at cable's peak, the rise of SVOD, the history of streaming devices, and appearance of skinny bundles. A few other trends – including AVOD (advertising video on demand) and sports streaming services – were less important to the history of the larger cord cutting trend, and so get less attention here. Our story starts back in the dark days when cable dominated. The FCC puts the cable peak at around 2000, so we'll start our story there (you can peg the cable peak in a few different ways – market share, raw numbers, growth stats, etc. – but 2000 is a pretty good spot to mark the all-around peak). Traditional pay TV has been losing ground to cord cutting ever since, though not exactly steadily – as we'll see, things take a real plunge in the late 2000s, particularly around 2007 and 2008. The seeds of cable's demise were already being sown at this point. Huge monopolies existed (and still exist) in large portions of the country, and cable bills were rising faster than inflation (believe it or not, they still are). There wasn't yet much of a way to avoid this without living an entertainment-free life, but as we'll see in the next section, that would soon change. First, though, let's set the stage a bit. MLB Advanced Media – the folks behind some of the most reliable streaming service architecture on the market today – were also getting their start back in the dark days before the cord cutting trend took off. MLBAM was founded way back in 2000, and they made early efforts to stream individual Major League Baseball games before launching MLB.TV in 2003. That makes MLB.TV arguably the earliest important streaming service. But what would really launch the cord cutting trend would streaming video on demand, or SVOD. We'll get to that in a moment, but there's one more thing to cover here: the Digital Transmission and Public Safety Act of 2005, which switched over-the-air broadcasts from analog to digital. That rendered old over-the-air antennas useless, but the government sponsored a program that provided coupons for converter boxes. The transition wrapped up in 2009, leaving us with the digital OTA HDTV we have now – right around the same time that the streaming services were making a big splash. In 1997, Netflix was founded. When Netflix began, though, it wasn't the streaming service we know today. Instead, it was a movie rental service that competed with video rental stores like Blockbuster and Hollywood Video (remember those?). Netflix subscribers made a list of movies and TV shows they wanted to rent, and Netflix mailed them DVDs, which subscribers would then mail back when they were finished. Netflix didn't stick with that business model, though, which brings us to the pivotal moment in the history of cord cutting: the rise of SVOD services. It wasn't until 2007, when Netflix was 10 years old, that the company unveiled a “watch instantly” feature. It was the first really important streaming video on demand (SVOD) service (YouTube dates to 2005, but was all about user-generated content rather than licensed films and TV shows). Netflix's streaming service took off, and it's around this point – the late 2000s – that the history of cord cutting really begins in earnest. Netflix wasn't the only catalyst. Hulu debuted that same year – 2007 – as an AVOD service, and Amazon Video (which had started as a Amazon Unbox) rebranded as Amazon Video on Demand in 2008 and expanded its library significantly in 2011. HBO debuted HBO GO in 2010. HBO GO requires a pay TV login, but HBO NOW, which debuted in 2014, made the service available directly to non-cable subscribers. Netflix's online viewing service was great, but a lot of people didn't use it early on. After all, who wants to gather the family around the desktop computer for movie night? Then a new company announced a solution to this problem. Roku's Roku DVP, a Netflix player for your TV, was released in 2010. Later generations added the ability to watch other streaming services, too. The second generation Apple TV also debuted in 2010 (the first-gen model was a bit ahead of its time when it appeared in 2007). Soon, streaming boxes were everywhere. The Chromecast and Nvidia SHIELD came along in 2013, and the Fire TV made its debut in 2014. Streaming boxes got more powerful, and streaming sticks like the Roku Streaming Stick and Fire TV Stick shrunk the technology down into more portable devices. These days, the streaming device selection is huge – and growing (here's our piece on the best streaming devices). 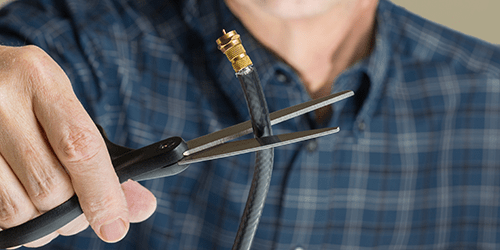 By 2015, cord cutting was well under way (and we were launching this site!). But OTA remained the only way to watch live TV without traditional pay TV, and that meant there was really no way to watch network channels like AMC. That changed with the debut of Sling TV, the first major over-the-top (or OTT – meaning streaming) skinny bundle. Skinny bundles offer cable-like packages of live TV channels, but they slim down the selection and drop the price significantly. Sling TV debuted in 2015, and while it had some growing pains, it soon emerged as a viable alternative to cable. PlayStation Vue, a skinny bundle that began life as a PlayStation exclusive, expanded to other platforms and turned the skinny bundle market into a two-company race. Others arrived soon after, including DirecTV Now. DirecTV Now is owned by DirecTV, of course – just as Sling TV is owned by Dish. The writing was on the wall by 2015, so it was no surprise that traditional pay TV companies were racing to hedge their bets by introducing services targeting cord cutters. We're in the midst of the skinny bundle race right now. fuboTV has expanded from a soccer-only skinny bundle into a more general type of service. Hulu has launched a beta version of their live TV service (read our review here), and YouTube has brought their new skinny bundle to select markets. This is a space where we expect to see even more growth soon. So what's next? So far this year, we've seen an increased emphasis on combining OTA and OTT solutions. Recent years have also seen a rise in niche streaming services, as well as the increasing competition in the skinny bundle space that we discussed above. One thing is for sure: people are still cutting the cord. Cable has continued to lose ground, and cord-nevers – people who have never subscribed to cable or satellite – are joining cord cutters to form a growing cord-free market for skinny bundles, SVOD services, and OTA.